I was very lucky to work with Director Eric Goldberg on “Fantasia 2000“. The style was broad, rubbery, and cartooney. Great fun to animate! We each were cast in about 4 scenes in the film. 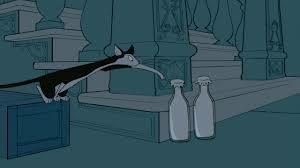 I was awarded the first two cat and the milkman scenes. I also animated Joe jack-hammering on the skyscraper, and Nanny passing out on the street corner. My mind stretched in this new rubbery animation style. I learned it is OK to stylize a character outside my comfort zone. Animating the Hirshfeldian designs was like permission to enter abstraction. My design sense grew enormously. I apply that freedom to my stone sculpture designs often, especially the horses.